Home > Our School > News > General > St. John XXIII CES Remembers! 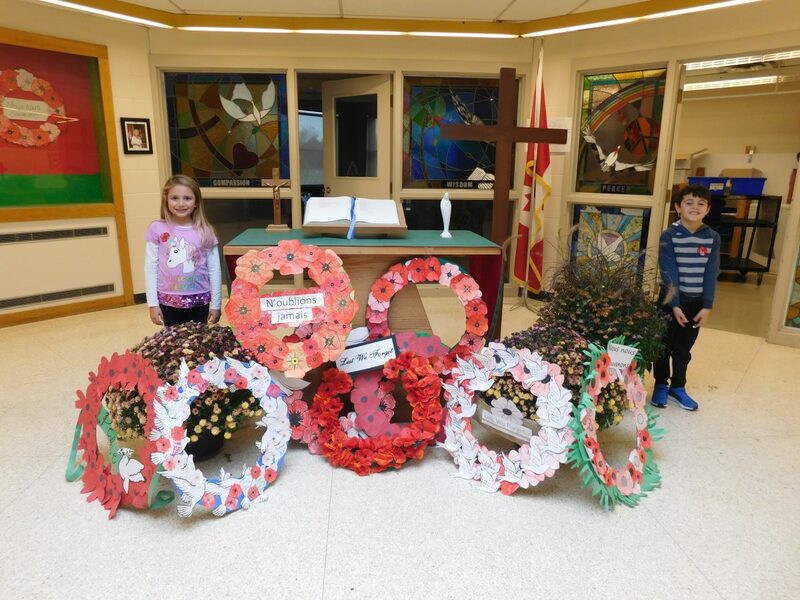 St. John XXIII CES Remembers! St. John XXIII CES was honoured to host a Remembrance Day service for its school community on Monday, November 12th. The morning began with a motivational presentation for our grades 4-8 students by a Canadian Veteran, Sergeant (retired) Terry Spence. At 10:45 am, the entire school community gathered in the gym for a Remembrance Day Service. It commenced with the laying of wreaths, created by our students. Prayers, songs and playing of “The Last Post” followed, along with a two-minute moment of silence. Our Canadian veteran Sergeant (retired) Spence was our guest of honour during this service. The talented grade 7/8 class sung “Where have all the Flowers Gone” under the direction of Mr. Yu. A special thank you is sent to Mrs. Fitzgerald and Mr. Yu as well as our amazing grade 7/8 class who performed so beautifully. Not a dry eye remained in the gym. The service ended with Principal Violante reminding us to continue to honour our soldiers by spreading the message of peace and love to those around us. It is important for us to forgive the little things, show respect always, and be peacemakers as often as possible. The school climate was amazing as we all took away this powerful message!